Kenya’s top female pugilist Conjestina Achieng on Monday received a major boost when Kenyan entertainer Daniel ‘Churchill’ Ndambuki handed her 180,000 shillings as fulfillment of a one year rent payment pledge made last year. Churchill pledged to pay for Conjestina’s rent at her Buru Buru home as part of his contribution towards supporting the pugilist’s recovery. Conjestina has been facing torrid times in the recent past, a situation that saw her twice hospitalized at the Mathari mental hospital for what was diagnosed depression related ailment. Conjestina’s plight was first highlighted by Kiss TV’s Michelle Katami last year, a feature TV story that told the silent suffering of the former star whose life had turned from fame to shame. Many concerned Kenyans were moved by the boxer’s plight leading to the campaigns that were dubbed ‘Pamoja Conje’ and ‘Kenyans for Conje’ initiatives. The campaign also saw high profiled personalities champion the cause and they included Ambassador Yvonne Khamati, Blogger Robert Alai, PM’s wife HE Ida Odinga, Musicians Susanna Owiyo & Nonini, Journalists Michelle Katami, bankers, lawyers, amongst others. 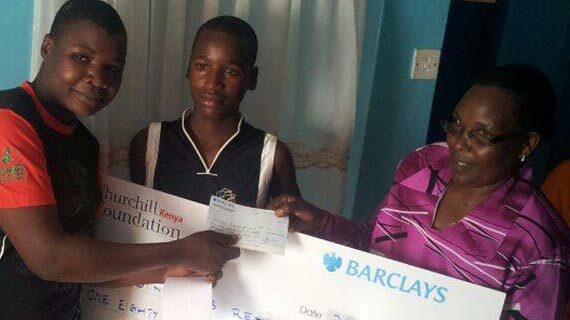 During the cheque presentation ceremony on Monday, Churchill made the full payment of Ksh.180, 000 to Conje’s landlady Ms. Susan, an amount that will cover the rent from February 2013 to February 2014. The boxer who was flanked by close family members and Laugh Industry staff members at her Buru Burtu house thanked Churchill for being generous and kind hearted.